So much Shakespeare, on stage and on film, has an eat-your-vegetables quality to it: it's not really good, but, we're told, it's good for you. And truly nothing is more painful to watch than an unfunny comedy—when the performers are expecting the audience to laugh and nobody does, it's brutally uncomfortable. (One of my all-time favorite theater-going moments was at the New Jersey Shakespeare Festival, at an appalling production of a Shakespearean comedy�nobody laughed at anything, until I noticed, seated just in front of me, Frank Rich, then the theater critic for the New York Times, lean over to his companion and say: "The man who wrote this should be shot.") Happily, this film of perhaps Shakespeare's most grand comedy doesn't bring with it any cobwebs or threats of term papers; director Trevor Nunn assembles a stellar cast, who help to remind us of the fun and delight in so much of Shakespeare. Nunn is known primarily as a theater director; he was one of the principal forces at the Royal Shakespeare Company for decades, and while his productions were always models of directorial clarity, they could get a little grand. Sometimes you'd watch and see the actors getting caught up in the poetry, at the expense of the story; the plummy tones are lovely, but not for three hours, and when you cannot really puzzle out just what is going on. (Also, Nunn has more to answer for, for his work as the director of Cats.) But there's none of that ponderousness here�these characters and actors don't just exercise the muscles from the neck up. Perhaps unwisely, Nunn has added a prologue to Shakespeare, used as an expository device; it's easy to see what he was thinking here, but it deprives his film from opening with one of the great first lines ("If music be the food of love, play on"), and suggests that Sebastian and Viola, the twins central to the plot, had some sort of nightclub act. But soon we're in the thick of things, and quite delightfully, too. The aforementioned twins are in a shipwreck and are separated; though both survive, they each assume that the other is dead. 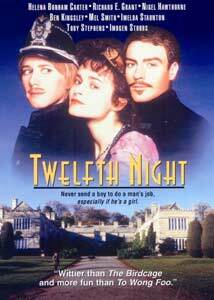 Viola knows that traveling as a woman alone is desperately unsafe, so she disguises herself as a man; calling herself Cesario, she soon becomes the favorite of Orsino, duke of the mythical country of Illyria. In her man's clothes, Viola develops a terrible crush on Orsino, who has Cesario/Viola serve as emissary to his beloved, Olivia—alas, Orsino's love for Olivia is unrequited, but she falls quickly and hard for Cesario. There's all sorts of mischief afoot in Olivia's household, as well; her sotted and aptly named uncle, Sir Toby Belch, wants to do little more than get drunk with his companion Sir Andrew Aguecheek. Sir Andrew, poor liquored-up soul, has dreams of winning the hand of the lady of the house, making this Cesario a terrible threat; also interested in Olivia's favor is Malvolio, the priggish head of household who is duped into thinking that Olivia may in fact harbor a secret love for him. Yes, it's dizzying stuff, tough to keep straight in just a couple of sentences; but it's always very clear in the film, and reminds us of the huge debts that just about all screen comedy owes to Shakespeare. The performers are especially agile in handling the verse while keeping to the sort of naturalism that works best in film acting. Helena Bonham Carter is a regal Olivia; Imogen Stubbs, dressed as a man for most of the film, is a charming, winning Viola. Toby Stephens makes for an Orsino both fatuous and dashing—he's got the charisma of Errol Flynn cut by a strong streak of self-mockery. The late Nigel Hawthorne is a spectacularly good and heartbreaking Malvolio, playing him as something of a variation on the Anthony Hopkins character in The Remains of the Day; the jokes at his expense take a dark and unsettling turn, but even when he's a buffoon, this Malvolio is always human, never a caricature. Mel Smith and Richard E. Grant have a merry old time as drinking buddies Sir Toby and Sir Andrew, joined by a garrulous Imelda Staunton as Maria, the maid; and perhaps best of all is Ben Kingsley, as Feste, the fool. He's in many ways the conscience of the piece, the character who knows more than he says, and the only one whom Nunn allows to speak directly to the camera. The director deserves particular credit for building to a comic crescendo while keeping all the story points clear, and for making especially good use of his locations. Nunn seems to be a sucker for topiary gardens; they certainly never appeared on the stage at the Globe, but Shakespeare's words and characters seem very much at home here. Image Transfer Review: Looks like a standard-issue Image dump job. A scratchy, blotchy print that isn't difficult to watch, but that hardly shines with the carefully rendered images of the Illyrian countryside. Audio Transfer Review: Sound levels are uneven, in large measure, it seems, because so much of the dialogue (Helena Bonham Carter's especially) has been looped, and not well. Extras Review: A behind-the-scenes featurette (08m:29s) consists of seemingly arbitrary footage of the crew setting up shots, pans through the locations, Nunn talking to his actors, and everyone huddled around the video playback. There are also six very brief interviews—most are a minute or less—with Nunn, Bonham Carter, Stubbs, Hawthorne, Stephens, and producer David Parfitt. The original TV spots and trailer are pegged to the kids, comparing this Shakespeare play to Priscilla, Queen of the Desert, and blasting in a few bars of the Village People and Macho Man. Fair Cesario, dost thou want to feel my body? Good Cesario, 'tis such a thrill, my body. Start quoting him now—yea, verily, this is a paragon of Shakespearean film adaptation, sure to amuse even those most phobic about the classics, and more fun than reading the Monarch Notes.